ExecOnline is hosting our annual leadership development conference, ExecConnect, to bring together the best business educators and industry-leading HR executives. We’re meeting in New York City on October 2nd and 3rd to help you learn how to better maximize your business agility. Today’s executives must master the ability to adapt and transform in a fluid, competitive world. At ExecOnline, we’ve identified areas where organizations can organize, lead, and drive change to revolutionize their business. Despite the critical need for increased business agility, studies show that only 47% of senior leaders can effectively create buy-in for their potential change initiatives. ExecOnline wants to help change this statistic. At ExecConnect 2018, L&D leaders will be inspired to become the catalyst for change at their organization and encourage smart planning choices in today’s constantly changing business environment. Each panel and keynote will deliver L&D professionals with actionable knowledge they can bring back to the business. You will take a deep dive into insightful sessions like “Transforming L&D for the Speed of Business,” where you’ll learn the skills you need to manage change while discussing the role of L&D in an agile environment. In addition, the “Accelerating Women in Leadership Positions” panel will discuss the ways in which organizations can better invest in their women leaders, as well as how these initiatives can financially impact the business in a positive way. These sessions and others will touch on common pain points, analyze real-world case studies, and spark new and unique ideas to bring back to your organization. We’ve gathered a unique group of experts, who have overcome their own business challenges, to share their motivating, career-changing viewpoints with you. We’re thrilled to have Columbia Business School Professor, Willie Pietersen, delivering a keynote on “Responding to Strategic Disruption” in which you’ll uncover your personal receptiveness to change (and aptitude for driving it). This session will provide L&D professionals with insights into breaking down strategic challenges in order to find creative and lasting business solutions. We will feature other stellar panelists as well, including Christine Geissler, CHRO/Regional VP HR at Kerry North America, Wagner Denuzzo, Vice President GBS Leadership Talent Transformation at IBM, Karen Atwell, VP Leadership Development & Field Coaching at First Command Financial Services, Maricel Perez Lovisolo, VP Learning & Talent Management at Jacobs Engineering, Adrian Stevens, VP Learning & Professional Development Talent Enablement at HPE, and Nurit Kruk-Zilca, EVP Global Human Resources at Ceragon. 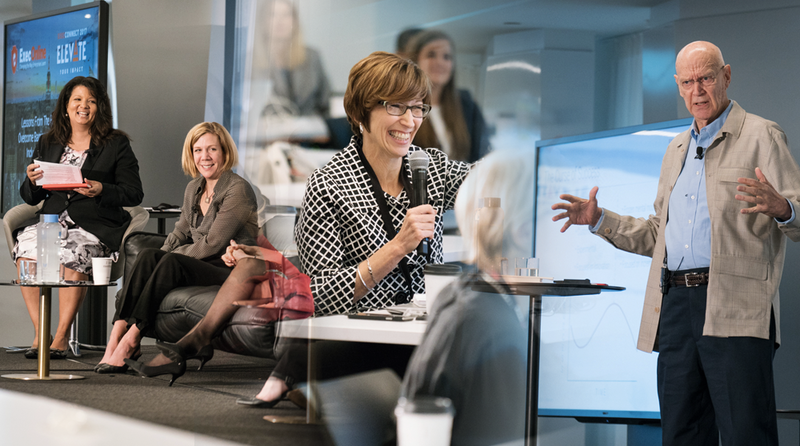 At ExecConnect, we’re excited to connect you with thought leaders who offer fresh points of view and inspiring stories to help shift your perspectives and deepen your understanding of leadership, motivation, and success. Check out the full speaker lineup here. We’re here to help you learn from the best! ExecConnect 2018 will be the hub for senior HR and L&D professionals to engage with elite business school faculty. The event is vendor-free, so it’s designed to offer plenty of networking opportunities for the 150+ conference attendees and prestigious business school faculty, attending from schools such as Columbia Business School, MIT Sloan, and Yale School of Management. Spend two days picking the brains of elite thought leaders and learning from the most prestigious names in the business. What are you waiting for? Join us on October 2-3, 2018 for ExecConnect! Register Today!